Many mums-to-be experience some swelling in their feet, ankles, neck and even face during the course of their pregnancy. Also known as edema, this is most likely to occur from 20 weeks onwards and tends to get progressively worse throughout the day. In the vast majority of cases, this isn’t something to worry about and it’s usually caused by excess fluids. However, in some rare cases, or when paired with other symptoms, swelling can be a sign of more serious conditions. If you’re worried about swelling you’ve been experiencing during the course of your pregnancy, or just want advice on how to relieve the discomfort – don’t delay, talk to a doctor today. Your body is subjected to a whole host of changes as your pregnancy progresses and as your baby develops, it puts pressure on the blood vessels in your uterus. This in turn affects veins in various parts of your body, causing blood to pool and creating pressure, which forces water into the tissues of your feet and ankles. While your body would usually absorb this, chemical changes in your body caused by pregnancy means you’ll retain much more. 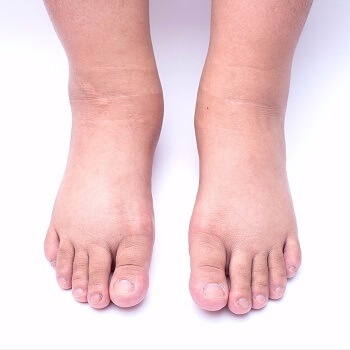 Edema tends to get worse throughout the day, especially if you’re on your feet and usually gets better in the morning, since lying down all night gives the fluid time to dissipate. While swelling affects practically every mum-to-be and isn’t usually anything to worry about, when it occurs alongside other symptoms edema can be a sign of something more serious. If the swelling suddenly comes on, is confined to just a single leg, or you’re experiencing headaches, blurred vision or light sensitivity – this could be a sign of a more severe condition known as pre-eclampsia. If you’re experiencing any of the above, or any worrying symptoms alongside swelling – it’s recommended that you speak to a doctor as soon as possible. While there’s nothing that can be done to cure edema, there’s a number of steps you can take to reduce the symptoms. Our doctors can talk through the swelling you’re experiencing and recommend effective ways to relieve your symptoms on a day-to-day basis.